Thanks to Oriental Trading for helping make this post possible. As always, all opinions are my own. 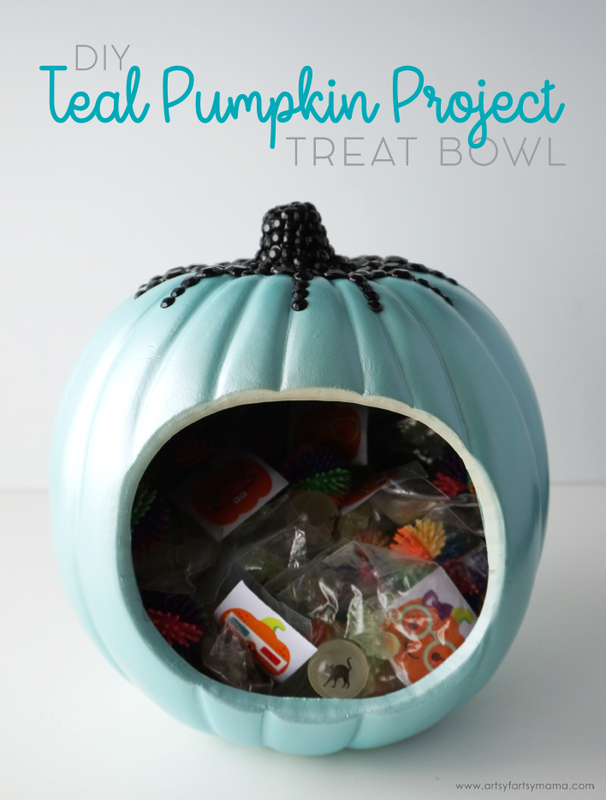 Make a glam Teal Pumpkin Project Treat Bowl filled with allergy-safe goodies to share on Halloween! As a family with a lot of food allergies, I wanted to make a project to help bring awareness to the Teal Pumpkin Project. 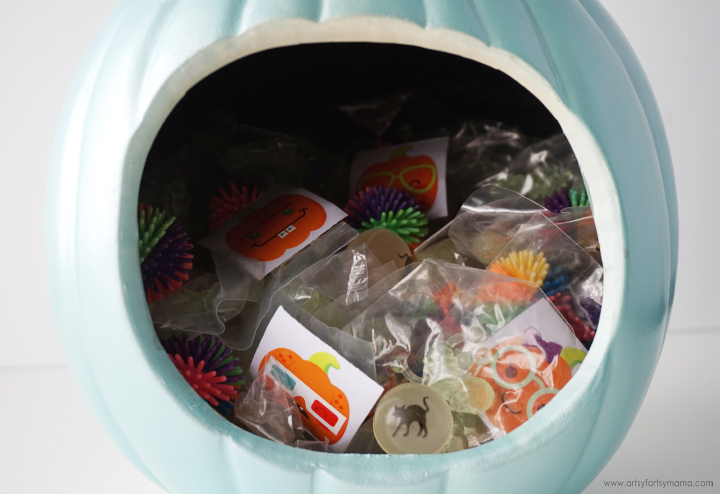 By simply placing a teal pumpkin on your doorstep, it means that you have non-food treats available for those trick-or-treaters with food allergies or other conditions. 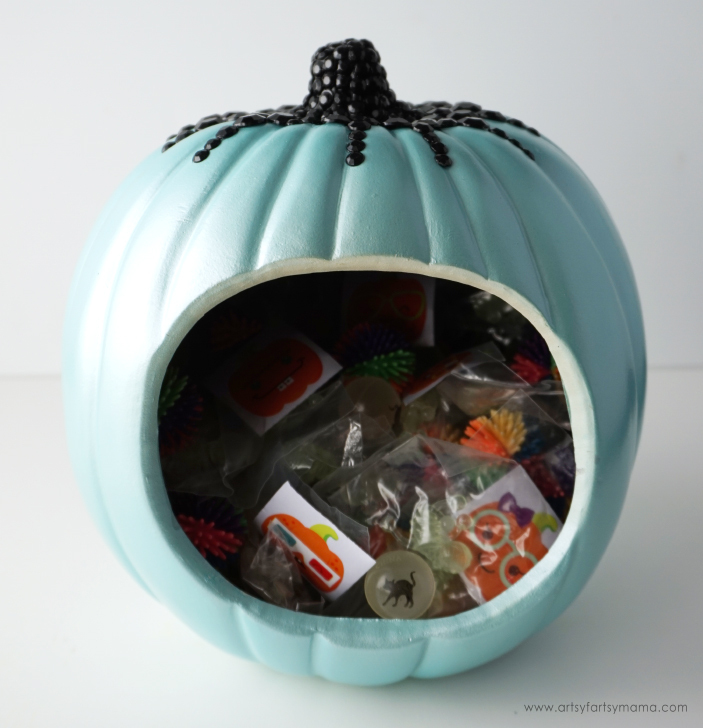 This pumpkin was a lot of fun to decorate, and I was able to find a lot of non-food treats from Oriental Trading that every kid will be excited to choose from. 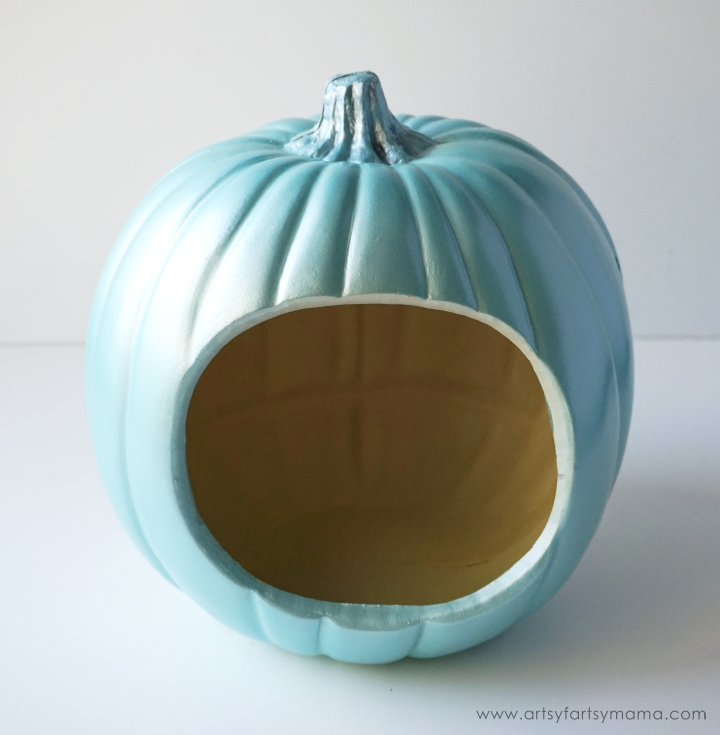 To make my treat bowl, I found a white diorama craft pumpkin at the craft store. 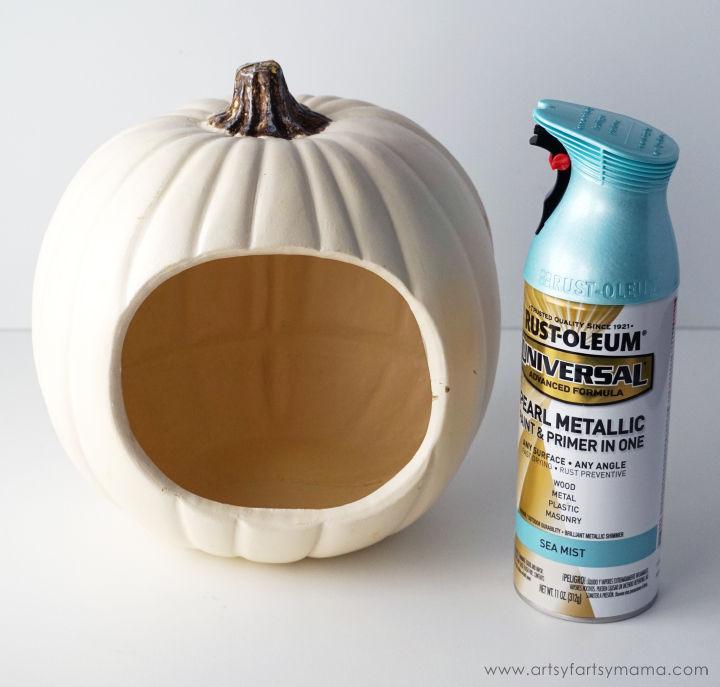 To transform the white pumpkin to teal, I used Rustoleum pearl metallic spray paint in "Sea Mist". 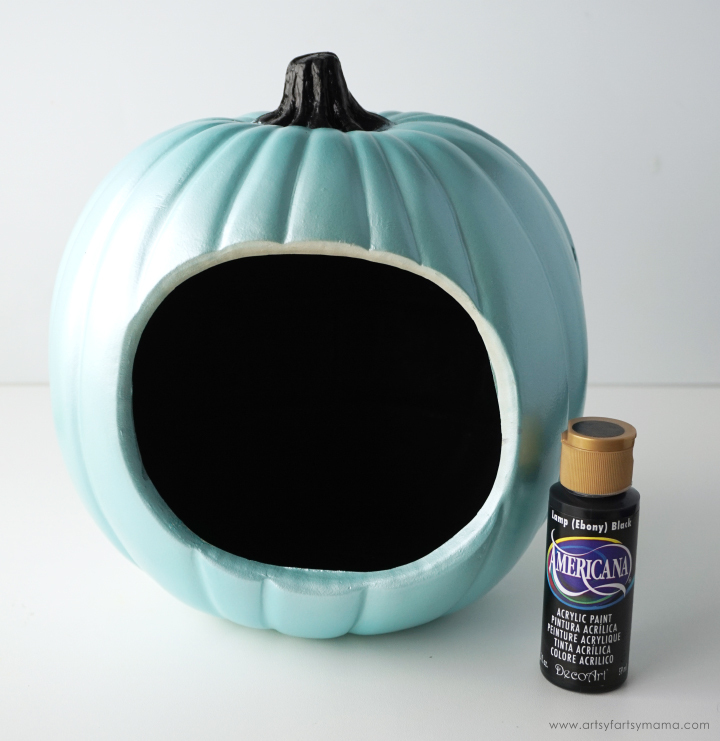 You could also paint the pumpkin with teal acrylic paint. If you can't find a diorama pumpkin, you can also find carvable craft pumpkins. It's important to make sure that they say "carvable" - otherwise, they are a solid foam and will not work for this project (ask me how I know). Spray 2-3 coats of paint on the outside of the pumpkin - but make sure to let each coat dry completely before adding another to prevent bubbling. Once the paint has dried, you'll need some black acrylic paint. 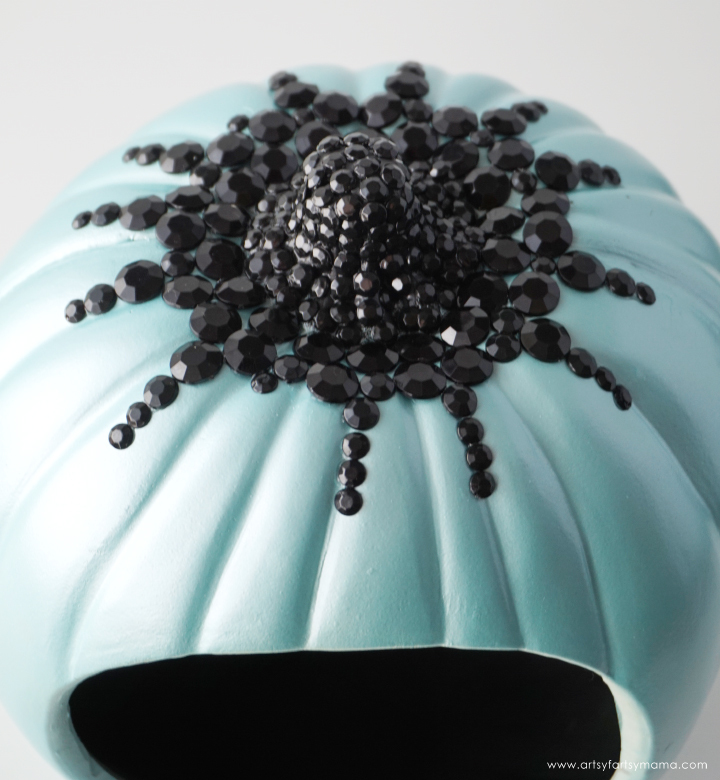 Add a 2-3 of coats of paint to the inside of the pumpkin. I also added a few layers to the stem. Let the paint dry completely. 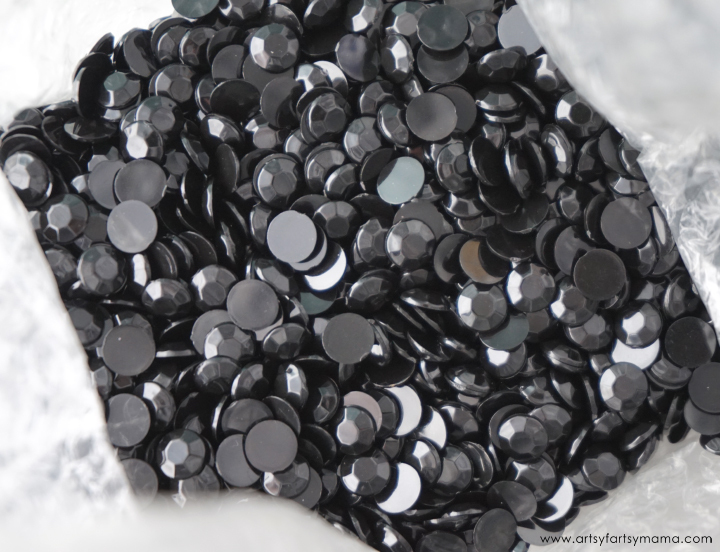 To add a bit of "glam" to the pumpkin, I found some black faceted round gems in different sizes. With a little bit of clear glue, I attached the gems to the stem and around the top of the pumpkin. This is a great time to get creative! Because you can see in between the gems, it's important to paint the stem well with the black acrylic paint. Set the pumpkin somewhere safe for it to dry for a few hours or overnight. 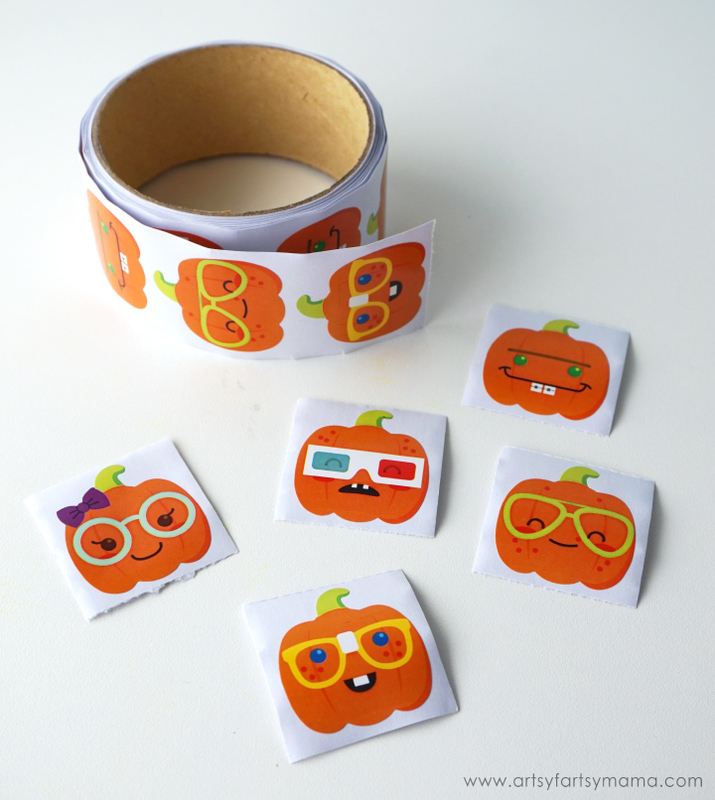 These Nerdy Pumpkin Stickers are adorable and are a safe alternative to sugary treats. The 5 sticker designs are 1 1/2" and you can get 100 on a roll! 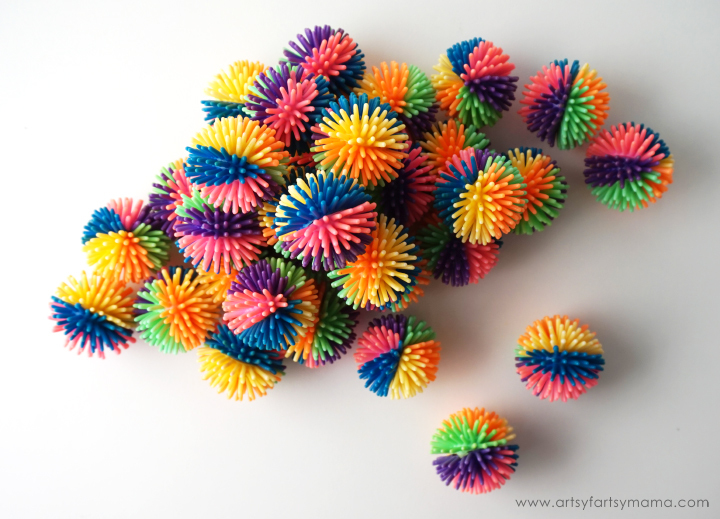 Multicolor Porcupine Balls are a ton of fun to play with, and are a colorful alternative to food and candy. They measure 1 1/4" and come in a set of 36! 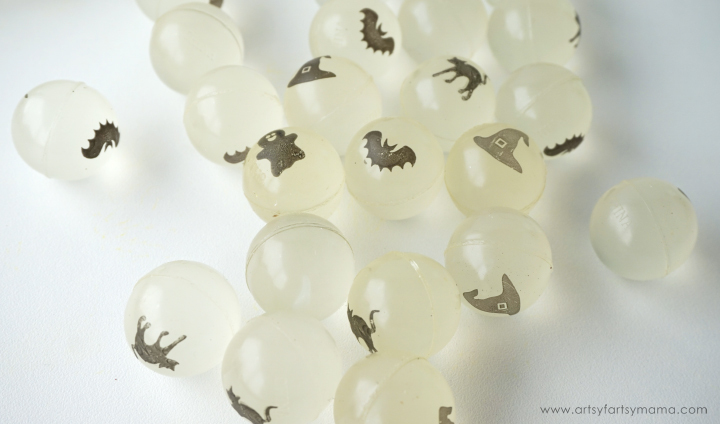 Glow-in-the-Dark Halloween Bouncing Balls are a perfect alternative to sugary sweets for trick-or-treaters! These 1" glow-in-the-dark bouncing balls in four different spooky designs will give the pumpkin an eerie ambiance. There are 48 balls in a set. 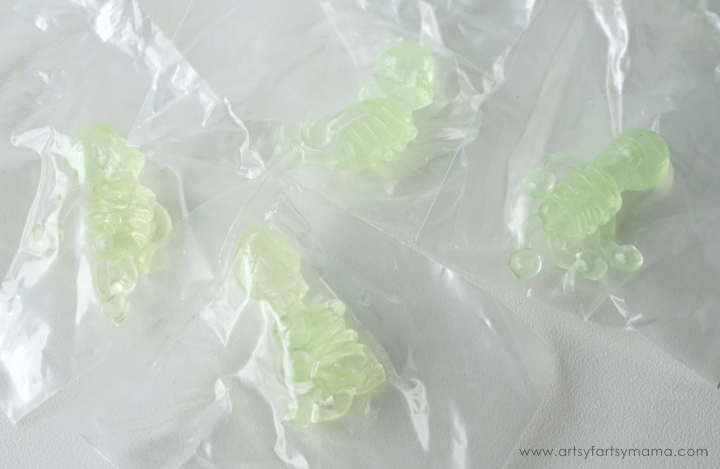 No bones about it - these Glow-In-the-Dark Tumbling Skeletons are a spooky addition to your Halloween treat bowl. Toss these 1 3/4" creepy rubber Halloween toys against a wall and watch them tumble - day or night! There are 48 skeletons in a set. Throw all of your allergy-safe goodies into the pumpkin and give it a good shake to distribute everything. This will also help it to be more more random when the kiddos reach in to take their treats! I can't wait for Halloween to get here so that we can share our teal pumpkin with the kids in our neighborhood. This would also be a great idea to share at school since there are usually a lot of kids with food allergies and other conditions that these prizes would be perfect for. What Halloween toys and non-candy items would you add to the pumpkin?